Does This Look Like Us? 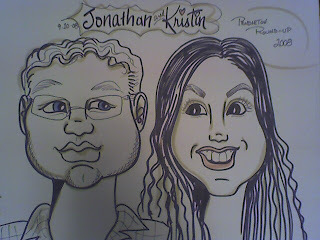 Kristin and I had a caricature of us drawn on Main Street in Pendleton on Thursday night. I don't think it looks like either of us and was a little disappointed with it. What do you think? Post your opinions. PS. You can click the picture to enlarge it for a closer look.